Hi Everyone! I’m freshly back from a trip to Whangarei to do some testing on the 97 prior to delivery. 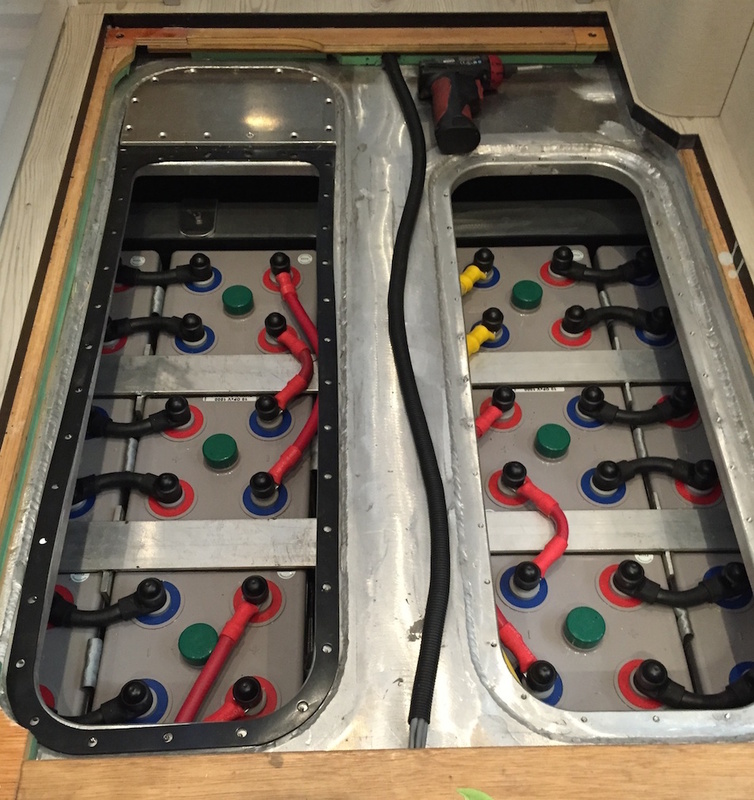 While Todd and Sarah relaxed in the boardroom with flat whites enduring endless meetings, I was able to get aboard the 97 and do some eagerly anticipated testing of the electrical system. For starters, the boat is amazing. Circa has done a fabulous job of taking the vision and turning it into reality, many kudos to the crew. Now to the fun stuff…The 97 has a large, 2000 amp-hour traction battery bank aboard giving us a ton of storage capacity and range. 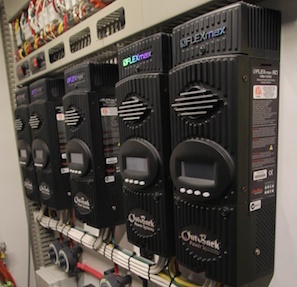 Between our standard Electrodyne alternator setup, which we know has the capacity to deliver up to 600 amps of charging capability and our solar array, we theorized a potential output capacity upwards of 790 amps. How awesome it was to record 898 amps during one of my tests!! We worked closely with Salt Service of Florida to come up with this array. 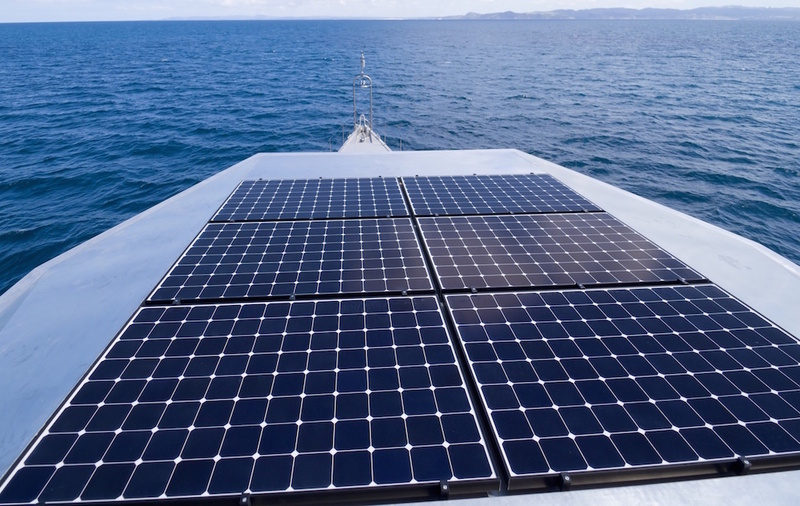 During the design phase we calculated that our 20 Sunpower 320 Watt * panels had the capacity to deliver 195-200 amps of charging capacity at 28.8 VDC (which included the inefficiencies of the charge controllers). *Note: Through further refinements, Sunpower has been able to increase the Wattage on the newer version of these panels to 345 Watts. 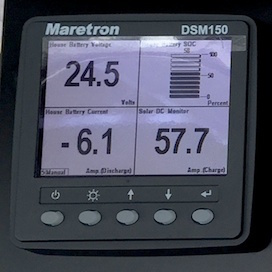 During one run at 11:30 am, with the average battery state of charge at 40% and a heading of 158° True (Summer- Southern Hemisphere), I observed an output of 238.8 amps from the Outback MPPT solar charge controllers. The panels were pretty clean during our testing. Where the system was truly impressive though was in its ability to provide 40-60 amps late in the day, or when it was cloudy as shown in the photo below. 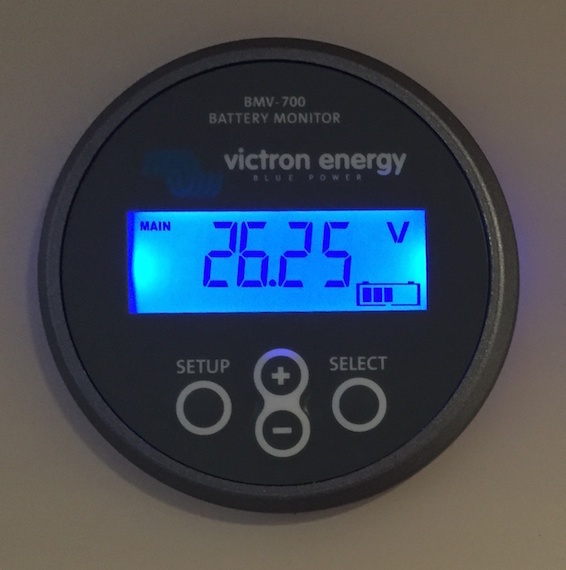 As a note, the battery SOC was 58% and the voltage without the solar array attached. 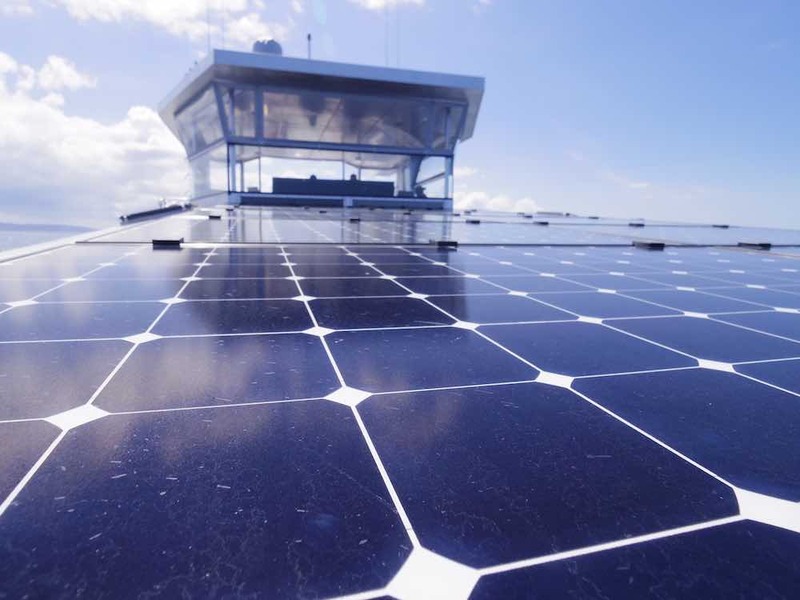 True to their word, the panels have a very long “solar day”, giving them a huge advantage over others. Based on my testing, I calculate the boat could realize a gain of 1200-1300 amps per day. One of the design criteria has been to keep the array cool. In 78°-85°F ambient temperatures with the sun directly overhead, the face temperatures ranged from 112-118°F while the underside never exceeded 101°F. We will continue to monitor as the boat gets into warmer climes, since we assume the face temperatures will climb and inhibit the output somewhat. This entry was posted on Monday, January 26th, 2015 at 8:25 am and is filed under Cruiser's Tech Talk. Both comments and pings are currently closed. That is some serious juice! My neighbors home has 20x320w Sunpower panels and he sells the overage to the power company. What brand batteries are in the FPB? We use Hoppecke OpZV batteries. To me it looks like the traction battery’s have been moved from the original drawings. Does that change the layout of the utility room? The batteries are basically in the same area, just dropped below sole. Regarding the layout, this has been refined from the preliminary renderings which allow for a larger crew cabin. Are you able to share a drawing of the refined crew area? Hi Paul, we don’t post or share drawings as a rule. Hi Mark: I wonder if you can comment on the extent to which the FPB 97’s systems room/guest cabin now offers something comparable to FPB 78-2: not just two bunks with a wet head, but also seating (and perhaps more of an ambiance with less high-power electric gear and pumps in plain view :); literally dropping the batteries certainly must have helped). As is, the publicly available plans make the 78 seem the better option for those wanting to attract crew? Hi Carl. The crew cabin of the 97 turned out a far better space than originally rendered. For privacy reasons, we are unable to share photos. However, the crew cabin is it’s own nicely appointed cabin with ensuite head, separated from the “systems” room, machinery, and hallway. The accommodation deck of the FPB 97 is fairly customizable within the boundaries of structural bulkheads and systems. A crew layout similar to the FPB 78 could be accommodated should the buyer desire. So, how many amps will the FPB97 consume in a 24 hour period given “average” or typical use? If the sky was dark and the gen turned off how many days of running are we talking assuming perhaps a 50% depth of discharge? No problem on sharing the drawings, to me it sounds like a good refinement, that was the one part of the boat I couldn’t get my head around. Is there a shower in the crew area now? Yes, there is a shower in the wet head with a partition for isolating the shower area from the rest of the head. Why use 24V for the battery bank? Wouldn’t 48V be more efficient? I know that the inverters and the charge controllers are able to do 48v, my guess is that the alternators are 24V as are the DC electronics and you don’t want to use a converter. 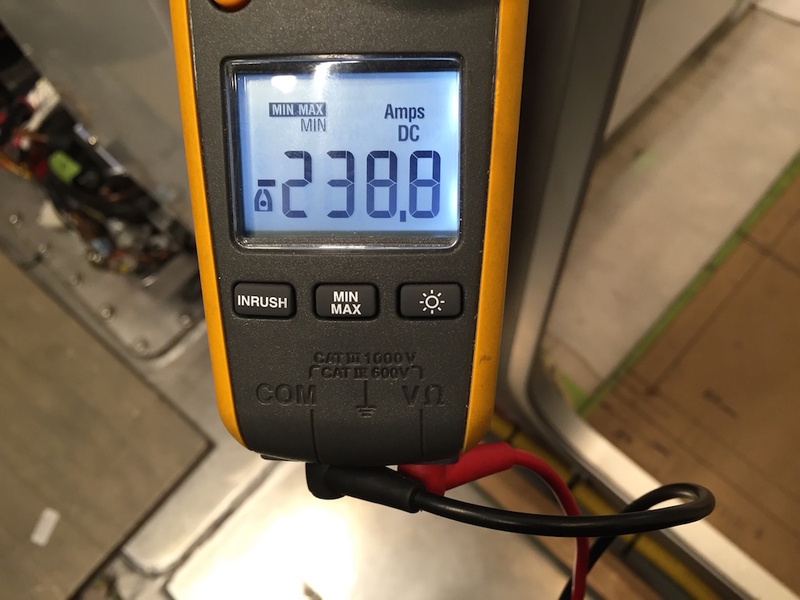 While 48V would seem to be more efficient, the availability of equipment that will run on that voltage is limited. 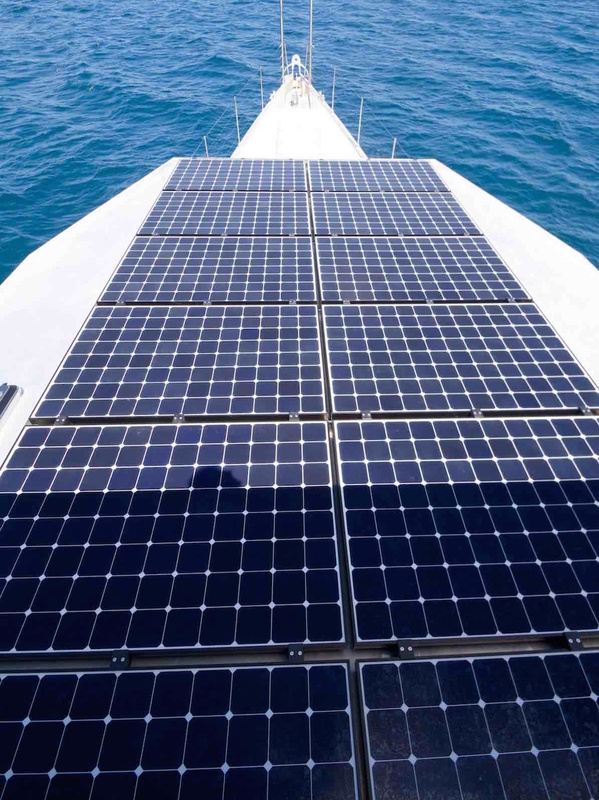 Therefore, when you consider the inefficiencies of converters, the remote places the boats travel and access to that equipment should it fail, we believe 24V to be the better voltage for our application. I went to Mooloolaba (Queensland, Australia) last week and saw Iceberg parked in the marina over there! Any word on how the maiden trans Tasman passage went? We are just looking at the VDR data now. Passage went well, no problems reported. I was wondering, why don’t you use any wind generators? There are obvious drawbacks but seems to me a few medium sized wind generators up top could have some benefits. They would add a trickle charge any time the wind is blowing. Over night when solar isn’t adding to the charge the little windmills could be buying additional hours without having to run generators. If power at anchor is the main issue, they wouldn’t even need to rotate 360 degrees if clearance is an issue. Just mount the blades in a solid housing & let the boat swing bow into the wind. Of course that would limit their usefulness. I am picturing something like a 2′ foot high box with 5 or 6 blades mounted in there that runs the width of the boat just under the radar & antenna. Built into the mast structure. Of course that’s more weight up high. Anyways, my brain is going 1,000 mph, that’s seldom a good thing. I was just wondering if you had seriously considered any type of wind generators & what benefits / drawbacks there would be. We have been looking at wind generators since we first saw a big permanent magnet unit belting out the watts in 1978. There are a couple of drawbacks which have kept us from this route. Noise, vibration, dealing with high winds, and safety issues. Now, with the high efficiency panels that are available wind generators make even less sense to us. I was wondering if it would be feasible to replace the battery banks with a Tesla Powerwall (http://www.teslamotors.com/powerwall)? Perhaps some day. But right now all of the high density solutions are a bit on the tempermental side for our needs. Do you have any experience with this style of battery, or does anyone else?